One day @ a time: The swami who gave me one rupee.. They say time is a great teacher and I cannot agree more. But if you are looking for a short term, crash course, I recommend travel. Every journey is like a miniature Mahabharatha, letting you come face to face with people and situations of all possible kinds. There are no theories there, everything is learned by practice and the learning continues every minute. If you want to understand something, what better way than to feel it and pass through it? When Jayan and myself returned to Ghangaria from our Hemkund trek, we noticed a small gathering in front of a tea shop. Curious to know what is happening, we peeked in. 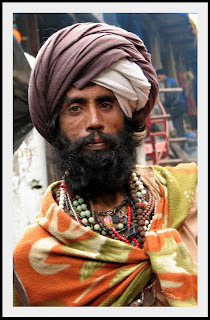 Inside the shop, a swami was sitting on a chair, wrapping shawls around his head to make some kind of a head gear. He was able to create some drama around it with his swift hand movements and fierce look on the face. He had at least two rings on each of his ten fingers, bangles of different colors and sizes covering his entire fore arm, and a bunch of chains around his neck as well. He was wearing a faded saffron rob with a waistband made of clothes and rope. Few anklets and toe rings completed his attire. I asked a local guy standing outside the shop about this new character. 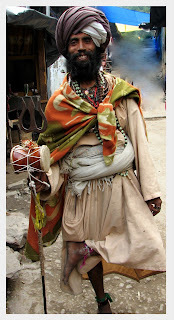 According to him, this swami was new in town and nobody knew where he came from or where he is going. Everybody huddled around seeing his interesting look and gestures, in anticipation of some theatrics for which the swamis are famous for. Though another guy said "sab naatak hein", I thought the guy is an interesting subject for a picture. I took the camera and stood behind the crowd to get a clear shot, I did not want to venture out to the middle and gain his attention. He was reaching the end of his turban making routine, following which he cracked all his fingers together by pressing them against his face. All the 25 odd rings were visible on his fingers, and I clicked the shot. To compensate the slow shutter speed in the dim light there, I had to hold the cam still for a few seconds. The moment I lowered the camera, I noticed that the swami was looking straight at me.. so was the crowd. I could sense the anger in those eyes, not the kind which says 'how can you invade my privacy', but the kind which says 'how dare you disturb me'. The crowd waited for something to happen as I tried to walk away from the scene. The swami called out 'hey' and asked me to join him in the middle of the crowd with a hand gesture. I had read stories about angry swamis and their terrible actions once disturbed... the object of disturbance was often transformed into an animal or stone if not instantly burnt to ashes by opening their powerful eyes. My plight looked like the former, as this swami had his eyes opened for quite some time and by the third law of thermodynamics, all the burning power would have been lost by now through convection or radiation. So as I walked towards him, I was weighing my chances in my mind. In case his plan was to transform me to an animal, I wished I get at least the time to make a plea - 'please don't make me a pony..anything else would do'. I had seen the plight of poor horses weighed down by the fat asses seated on them!! Anyway, I approached the swami and sat on a chair across him. While the crowd waited for their 'value-for-money' moment, the swami turned towards me with a twinkle in his eyes and said.. The collective 'huh' from me and the crowd was loud enough to convey the relief and disappointment it contained. While I sat there explaining to swami how I can take a better picture in the bright light outside the cafe, the crowd was slowly dispersing, dejected at being failed by yet another yogi. The swami himself had lost his grip over the crowd once he uttered those words. For the crowd, a swami who got excited by a camera did not fit into the definition of a real yogi. But he didn't seem to care about all that's happening and happily came out of the tea shop for the photograph. He stood there giving me the Shiva pose - one leg bend over the other, a thrishul fitted with a small drum in one hand and the other hand raised in a blessing gesture. His eyes were twinkling with delight. I took a few pictures of him and some with Jayan and him. He was more like a kid who had just been given a big candy bar.. nothing like a yogi or swami. After the photo session, as a gesture of gratitude, Jayan gave him a 10 rupee note. He refused to accept it and asked for a one rupee coin instead. We did not have a one rupee with us. So he said that he will give us one rupee. He searched through his pockets and retrieved a coin from one of them. He again got into the Shiva pose, looked towards the heavens with the coin in one hand, chanting something. After a minute of chants and hand gestures he gave the coin to me. He asked to put the coin in milk the coming Tuesday and then keep it in my valet. According to him, my valet will never be out of money and all my wishes will eventually come true as long as I don't lose the coin. 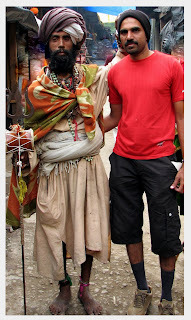 I thanked him, accepted the coin and walked towards our hotel while the swami went back inside the tea shop. We saw him again the next morning, sitting and having a smoke in another cafe. When I thought of the whole episode later, a lot of questions popped up in my mind. Why did he risk his reputation among the crowd by showing his excitement over a photograph, one which he didn't even get to keep? Why didn't he accept the 10 rupees we offered him and instead gave us one rupee? What was all the theatrics at the cafe about? You didnt tell us of the Milk ??? Excellent beginning and end to the blog dude - excellent aint the word for the beginning. Dude you still have THE COIN with you..? You are hopelessly ridiculous I say! But I still like you being like this. Not at all. I meant what I say man! Hey give some credit to yourself once in a while ok.